I wish I had heard about this concert. It would have been great to be there. Thanks Robin for the review, always a pleasure to hear your words. I first heard/saw Sumire Yoshihara with the Radio-Symphonie-Orchester Berlin in 1973. I was a 16 year old traveling and taking in the world, as one did at that time. She blew me away (I still have the program) and I have been drawn to percussion ever since. I have ‘followed’ Ryan since first hearing/seeing him perform with Esprit years ago, so what a delight to see the two together! Wish I’d known about his talk. It is impossible to discuss the biography of Keiko Abe and history of the marimba in Japan without reading and referencing my book, “Keiko Abe ~ A Virtuosic Life: Her Musical Career and the Evolution of the Concert Marimba” (published in 2007 by GP Percussion). I spent six years on this project, including hundreds of hours of interviews with Japanese composers, marimbists & xylophone players. My original research presents documentation of historical facts of the marimba and of Keiko Abe’s life and career. I would like to clear up some mis-conceptions that you have presented here about Abe’s work. 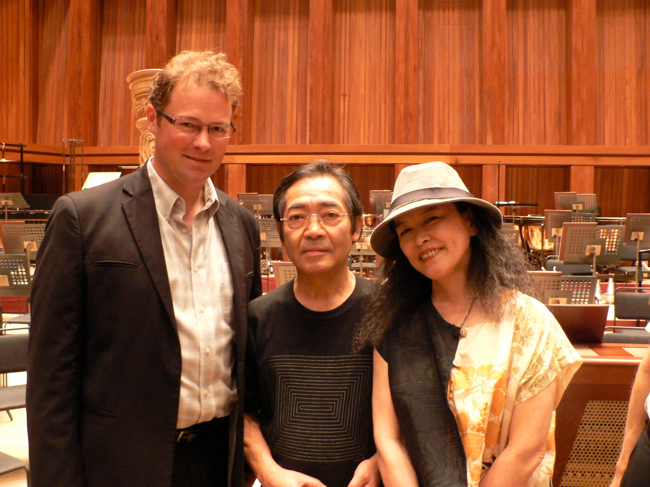 Keiko Abe’s first composition for marimba was “Frogs” written in 1958, not Michi. Michi was written in the mid-1970’s as she began experimenting with improvisation, not the 1960s. Keiko Abe’s early career was built on her work in the recording studios and orchestra percussion section in Tokyo. Her pop music group “Xebec Xebec Marimba Trio” played arrangements of folk and pop music exclusively. She also recorded and perfomed pop music arrangements as a soloist. She was a TV star in popular music as she began exploring commissioning composers to write contemporary classical music for the marimba. I applaud the additional work Mr. Scott has done with his project and hope additional researchers and scholars add to the body of knowledge. Dear Rebecca – Thank you for your e-mail. I have sent it forward to Ryan Scott who will, as did I, benefit from its contents. I look forward to reading your book.